Full service Gasoline service station awarding station dealerships Nationwide. Incorporated in May 2002 in Davao City, Phoenix Petroleum Philippines, Inc. has grown from a simple family venture to one of the most successful businesses in Davao and the Southern Mindanao area. The company, then under the name Davao Oil Terminal Services Corporation (DOTSCO), began operations in its current form in January 2004, distributing petroleum products to various commercial entities in Mindanao. In August 2006, the company was officially renamed to Phoenix Petroleum Philippines, Inc.
Today, Phoenix Petroleum is engaged in the business of trading refined petroleum products, lubricants and other chemical products, operation of oil depots and storage facilities, and allied services, mainly in Southern Philippines. 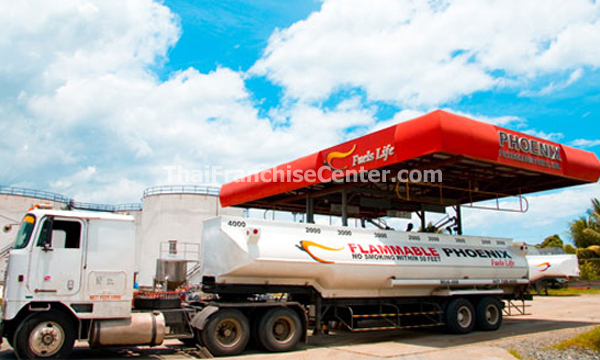 Its products and services are distributed and marketed under the “Phoenix Fuels Life” trademark. Investment The conservative amount for franchisee-owned stations is Php3,000,000.00 including the franchise fee, construction cost, equipment deposits and initial stock. of investor Individuals who have the needed capital, have the capability and the willingness to learn the business, and have the right attitude to operate a Phoenix facility. & Support Franchising a Phoenix station saves you time and money. With Phoenix, negotiations and approvals are faster because decision-makers are practically a call away. Recovery period of investment is shorter because of our low investment plan offerings and higher per-liter margin, which also grants you bigger earnings in the long run.